Daily Illuminator: A Super Munchkin Interview With Guest Artist Art Baltazar! December 5, 2016: A Super Munchkin Interview With Guest Artist Art Baltazar! Award-winning comic artist Art Baltazar (Tiny Titans, Patrick and the Wolf Boy), who illustrated our upcoming, action-packed release Super Munchkin Guest Artist Edition, answered a few questions for us about his process, superheroes, and (of course) cloning. Q: Your Super Munchkin art looks great! Before you took this project, were you a Munchkin fan? A: AW YEAH! I always knew about the game! We sell the Munchkin card games at our stores AW YEAH COMICS! Plus, I've always been a fan of John Kovalic's cartooning! Q: You've drawn a lot of very different projects in your time. What's your process for getting your head into new material so that you can illustrate it? A: I'm kind of familiar with all things pop culture – especially comics and cartooning. But sometimes I need a refresher. Thanks to the internet, I can educate myself on all things Munchkin, opening my brain to a much larger world! Q: What did you do to prepare to draw Super Munchkin? A: When Steve Jackson Games asked me to redraw all the cards, I thought . . . wow! That's a lot of cards. I love drawing and designing characters. So, preparation involved a large pot of fresh-brewed coffee and flipping each card over one at a time, and then drawing the first image that popped into my head. I just had to roll up the sleeves and get in there! Q: What's your favorite card from the set you drew? A: Wow. I liked a lot of them. The comedian guy stands out for me. 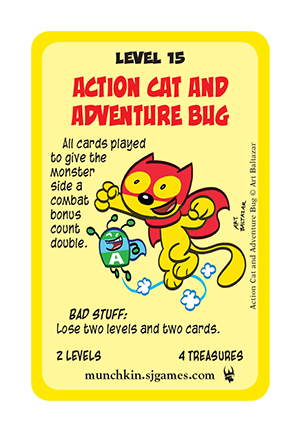 But I really liked drawing Action Cat and Awesome Bear in the set. My guys meet Munchkin guys. An instant classic crossover in the making! Q: What was the biggest challenge for you about drawing these cards? A: Hmm. The big challenge was getting them all done. It's like when you order a pizza. When it arrives, you are so hungry and you have no doubts you can eat the whole thing yourself! Then halfway through, you feel like you need help finishing. Let's just say, I am very thankful for the colorist! AW YEAH LIGHTER WORKLOAD! Q: If you could have a super-power, what would it be and why? A: Oh, man. I wish I had the ability to clone myself. Then I can be the art director of my selves and watch all these cool cartoonists work on multiple projects all at once. I could have 12 monthly books published around the clock! 24-hour comics forever! Q: Where can people find you online and learn more about your other projects? A: AW YEAH! I'm all over the place on all social mediums! The best place to find me is www.artbaltazar.com. There are links to my other web pages and you can shop for comics and read some for free! You're a good man, Munchkin! 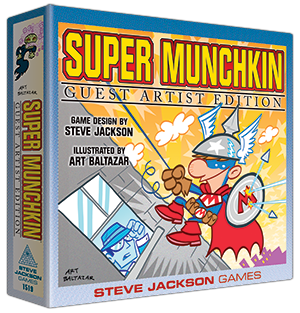 Pick up Super Munchkin Guest Artist Edition, available now, only at Target!